The Village Plaza Hotel was built in 1915, an 8-story structure designed by architect, Frank E. Vitolo. Its original name was Hotel Colborne. As described in the New York Hotel Record, volume 14, 1915, "Since publishing our article, February 29th, concerning the new hotel being built at 79-81 Washington place, proprietress, Miss Ila Johnson, has decided to name the house the Hotel Colborne, instead of Coylbon . . . The Colborne contains 100 rooms, arranged in apartments of one, two, three and four rooms, with bath, and will be ready for occupancy March 12th." Conversion of the Colborne Hotel to the Village Plaza Hotel took place in 1960. As reported by the New York Times, 13 April 1960, pg. 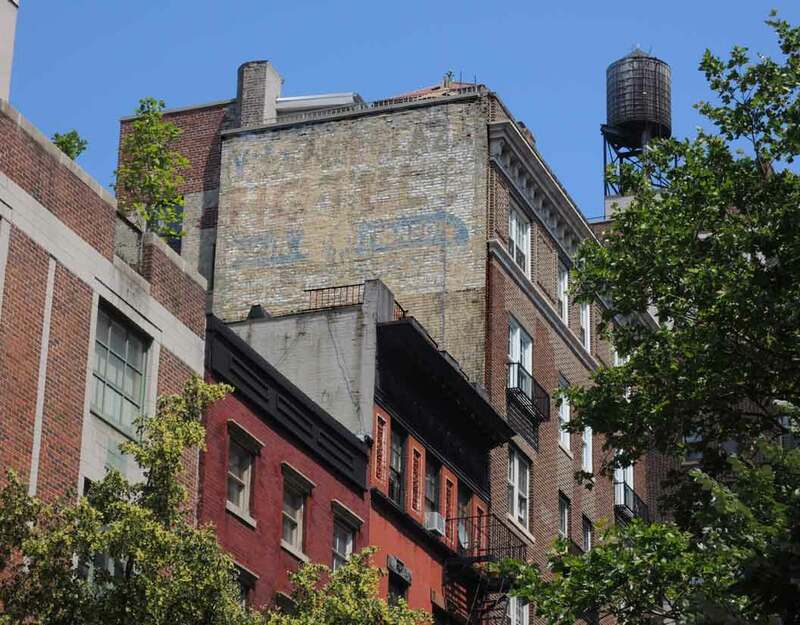 65, "The Colborne Hotel, an eight-story building containing 100 rooms and occupying a plot 50 by 100 feet at 79 Washington Place, in the Washington Square-Greenwich Village area, has been sold. The purchaser is Lawrence Meinwald, president of the Allerton House Corporation, operator of the Allerton House chain of hotels. Mr. Meinwald plans to air-condition and otherwise modernize the Colborne, which he has renamed the Village Plaza. He said he intended to build a hotel in Greenwich Village but found the cost would be prohibitive. The Village Plaza will be operated on the Continental style, according to Mr. Meinwald, who will move his office from the Allerton House, Eighth Avenue and Twenty-second street, to the Village Plaza." The original owner of the Colborne Hotel was Ila Johnson (1863-1940), born Colborne, Ontario, Canada, 9 May 1863. (Colborne is a township (population 6073 in 2011) near Lake Ontario, 142 kilometers east of Toronto.) Its name, then, became the source of Johnson's choice for the hotel. Ila Johnson appears in the 1920 U. S. Census as head of household at 79 Washington Place. She was 50 years old, born Canada, immigrated 1900, naturalized 1905, and her occupation was "Housekeeper Hotel." Ila Johnson appears in the 1940 U. S. Census as a patient in New York Hospital, York Avenue between East 68th and East 70th Streets. She died 22 May 1940. In addition to Ila Johnson, the 1920 U. S. Census recorded 86 boarders at 79 Washington Place. They were born in a variety of U. S. states and practiced varying occupations such as journalist, stenographer, salesman, and banker. The 1930 U. S. Census recorded 71 occupants of Hotel Colborne, 79 Washington Place, with varying occupations like milliner, teacher, writer, commission merchant and bookkeeper. The 1940 U. S. Census recorded 51 occupants of 79 Washington Place, with occupations like saleslady, teacher, musician, stenographer and attorney. Lawrence Meinwald (1914-2002) was a real estate operator who specialized in the areas of Chelsea and Greenwich Village. He was born 18 June 1914 in Warsaw, Poland, and immigrated to the U. S. age 6 in 1920. The internet is replete with links to video and audio presentations of Meinwald's contribution to the Ellis Island Oral History Program, which describes his emigration experiences. Information on his real estate career, however, is sketchy. He owned the Allerton Hotel at 302 West 22nd Street, which, like the Village Plaza, deteriorated to a shabby welfare hotel in its later years. An excerpt from a Report of the New York City Council Committee on General Welfare on the Homelessness Crisis (January, 1987) includes the phrase, "owned by Lawrence Meinwald, a notorious welfare hotel owner" (google books). Architect Frank E. Vitolo (ca.1888-1938) seems to have been active in designs in and around Greenwich Village from 1915 to 1930. In 2016 metrohistory.com listed 31 new building permits under the Vitolo name. A short biography of Vitolo appeared in the New York City Landmarks Preservation Commission report Greenwich Village Historic District Extension, 2 May 2006, reading, "Frank E. Vitolo, born in New York State, was established as an architect in New York City in 1915, designing tenement and apartment buildings and garages. Around 1918, he joined the firm of Kohn and Butler, an association that lasted until his death, though he also accepted independent commissions. Among the projects on which Vitolo worked were a 30-story office building for the Vanderbilt estate at 501-505 Madison Avenue (1929-30, with Kohn); a 43-story office building at 444 Madison Avenue (1930-31, with Kohn and John J. Knight); and the Welfare Hospital for Chronic Diseases (1938-39), Welfare Island." (Landmarks Preservation Commission, May 2, 2006, Designation List 373, LP-2184, page 33). This view of the entrance to the Village Plaza Hotel was taken by the photographer Edmund V. Gillon, Jr., ca. 1975. Gillon did the photographs in Margot Gayle's Cast-Iron Architecture in New York (1974).